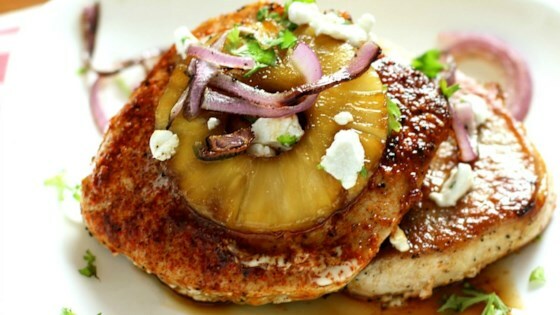 "Brown sugar-pineapple pork chops with caramelized red onions and tangy goat cheese are a delicious one-skillet supper. It's a sweet take on juicy pork chops that are quick and easy to prepare! Sprinkle with parsley for garnish, if desired." Combine chipotle powder, garlic powder, cinnamon, and onion powder in a small bowl. Heat 1 teaspoon olive oil in a large, nonstick saucepan over medium-high heat. Add pineapple rings and red onion; sprinkle with 3 tablespoons reserved pineapple juice and brown sugar. Cook until pineapple is lightly browned, about 3 minutes per side. Transfer pineapple-onion mixture to a plate. Pat pork chops dry and lightly season both sides with salt and pepper. Heat remaining 2 teaspoons oil in the same saucepan over medium-high heat; swirl to coat pan. Add chops; cook until bottom is browned, about 3 minutes. Flip and sprinkle the chipotle mixture on top. Cook until other side is browned, about 3 minutes. Continue flipping and cooking until no longer pink in the center, 3 to 5 minutes more. An instant-read thermometer inserted into the center should read 145 degrees F (63 degrees C). Transfer chops onto a plate and top with the pineapple-onion mixture. Sprinkle goat cheese on top. Fantastic! The flavours in this recipe are not ones I would normally put together... but they work wonderfully! Thank you for sharing this recipe! I made this for my wife and I and loved it. I only made two chops so I halved the seasoning for the meat but made 4 pineapple rings and half a red onion. We both loved it. Simple and delicious. I switched apples for pineapple and left off the cheese! We really enjoyed this recipe! I added a little more pineapple juice because we love it!